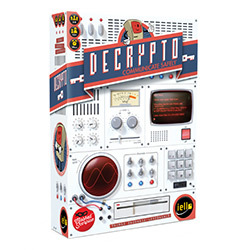 Iello games will release the code-cracking party game Decrypto in Q1. Players compete as two teams, attempting to correctly translate coded messages sent from teammates while also cracking the cipher of the opposing team. Each team has a screen where words are shown in pockets numbered 1 � 4. In the first round, one team member picks a card that shows a three digit code, and they must come up with clues pertaining to the words in the corresponding slots to pass on the numbers. If the rest of the team guesses correctly, they get a white token (interception). If they fail, they get a black token (miscommunication). In round two, a team member repeats the exercise, but this time the opposing team tries to guess the code. If they are correct, they get a white card, wrong � black. The game continues until one team receives two white cards (winning) or two black cards (losing). Games normally last 4 � 7 rounds. The box contains 2 screens, 48 code cards, 110 keyword cards, 4 interception tokens, 4 miscommunication tokens, 50 note sheets, 1 sand timer (30 seconds) and a rulebook. The game is for 3 � 8 players, ages 12 and up, and plays in 30 minutes.